The syllabus was a piece of art. Pictures of elementary school teachers wearing shirts that read “Black Lives Matter.” Quotes from the ever-inspiring writer, feminist, and activist Audre Lorde and from the wonderful wordsmith James Baldwin. Assignments that included readings from author Ta-Nehisi Coates and poet Claudia Rankine. Suggested texts that included reading of Beyoncé’s lyrics to Lemonade and Donald Glover’s dialogue from Atlanta. This was not a traditional education studies class. This was a class that accurately reflected the world around it. This was an education studies course that took a deep dive into the pervasive racism both in America and in our education system. This course is one of a number of equal opportunity (EO) courses offered for educational foundations majors at the College of Education. Taken throughout senior year, they offer future teachers a look at deeply rooted societal issues—such as patriarchy, immigration, and homophobia—that also affect the classroom. As a senior in the educational foundations program, I have taken two of these classes. They have shown me the importance, and power, of being aware and critical of my surrounding world. Everything I have learned, discussed, and read in these EO courses matters. In my time at the UO, no other classes have better prepared me to be a contributing citizen of the world, to make lasting change and to, ultimately, be a better human. During fall term, I took an EO course focused on racism that was taught by the seemingly omniscient instructor Asilia Franklin-Phipps. To take a course focused on racism after a tumultuous summer of racial incidents and during an incredibly vitriolic political campaign was harrowing. Each day, the news brought horrible realities to light that emphasized the importance of this class. I was able to see a system of oppression and incarceration as not just history but front-page news. It made what we were learning matter. We were not merely studying issues of the past, but issues of today and of all the foreseeable tomorrows. This winter, I am taking a class on patriarchy. We are looking into the deeply rooted, inner workings of the white-male-dominated and -controlled society that we live in. Having this course coincide with the inauguration of Donald Trump as president is another painful reminder of how much this course matters. To go from reading about the disturbing ways in which men have tried to own women’s bodies throughout history, to see the current administration pushing for health-care legislation that would take away a woman’s right to make choices about her own body, is disheartening. Whether I go on to be a teacher or journalist, or take some other career path, these courses will serve as a guiding light. These equal opportunity courses are what college is all about: understanding the world, challenging the world, and attempting to make it a better place. 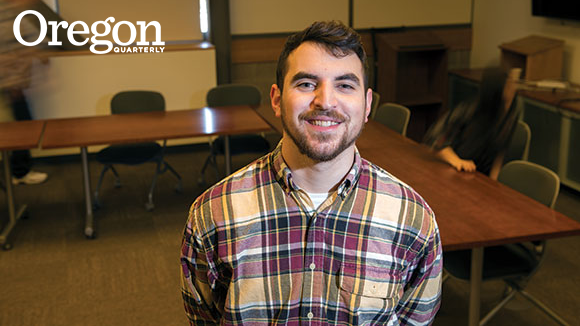 Zach Silva is a senior at UO, majoring in journalism and educational foundations. There is nothing he likes more than a good Granny Smith apple.